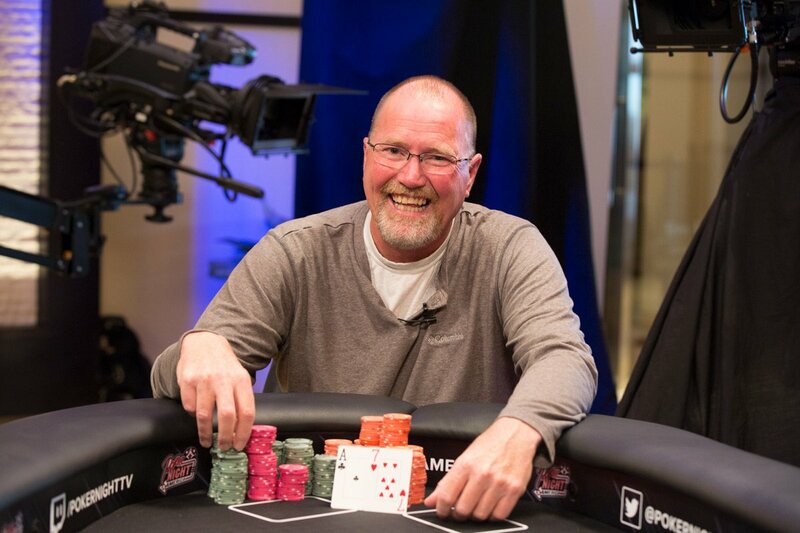 Grass Valley's Rob Anderson came back from being the short-stack at the 5-handed final table to become the 2017 Poker Night in America Main Event champion. 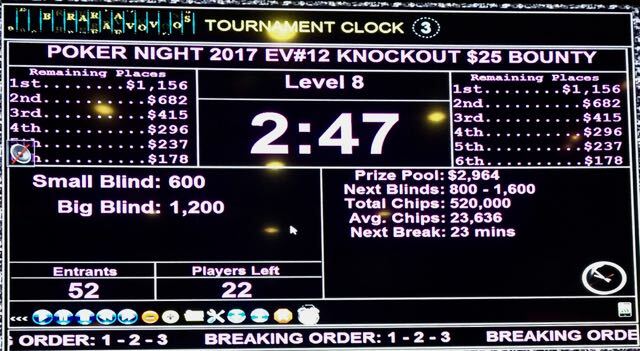 Here are all the Main Event payouts. The short-stack with just 700,000 chips at one point in 5-handed play, Rob Anderson battled back and eventually found his way to $65,780 and the 2017 Poker Night in America Main Event title. 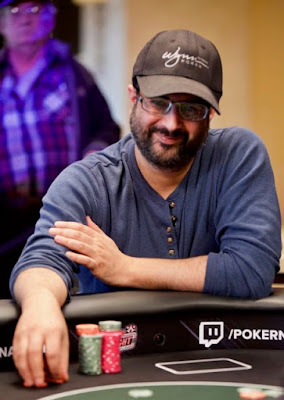 Anderson powered to a lead with strong play, almost had 3rd place finisher Ubaid Habib's full stack when both rivered trip 5's with Anderson's Ace able to play. Habib, however, found a fold but busted 5 hands later. 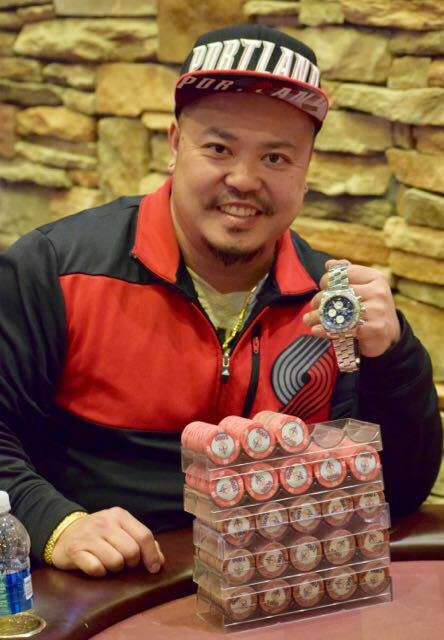 The major event was the next-to-last hand, Anderson 3-betting with AK and James Phamsopha 4-betting all-in with AT. 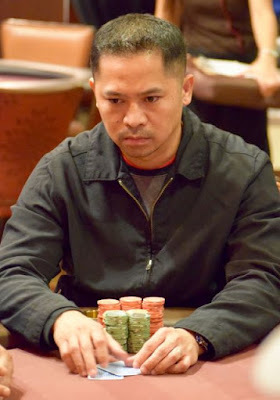 Anderson held, leaving Phamsopha with just 7BB. One hand later and Anderson - with a career-best $3,155 cash to his name - went 20x by winning the title. 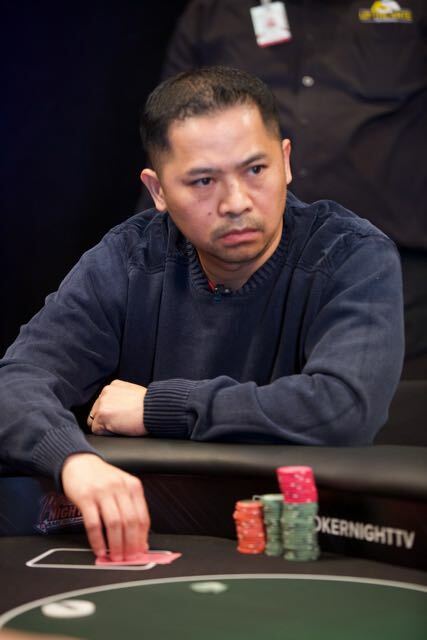 A big call that ended up putting James Phamsopha on the wrong end of AK v AT cut Phamsohpa down to just 7BB. 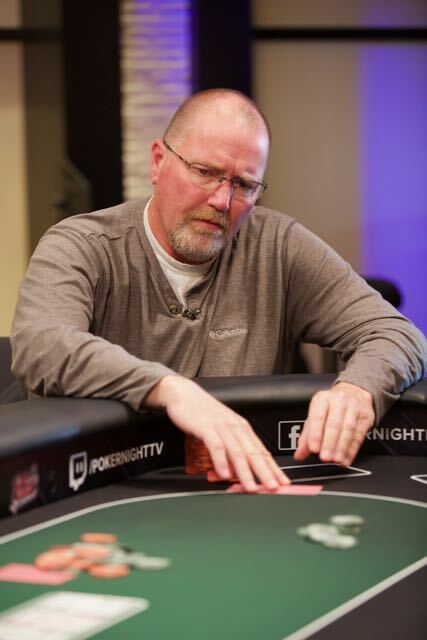 He was all-in the next hand K3 v A7 against Rob Anderson, and there was an Ace on the flop. 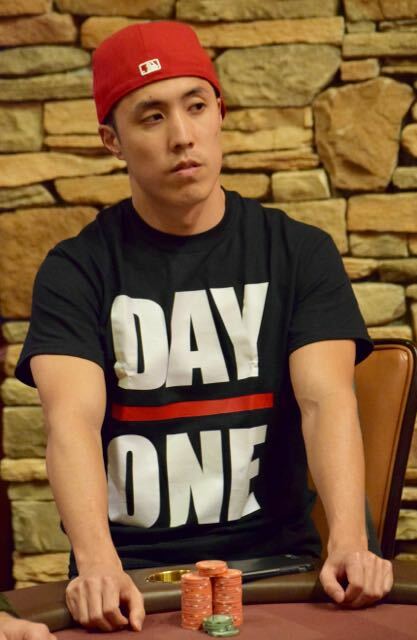 Phamsohpa - the Day 2 start-of-day chipleader - takes second place, cashing for $46,157. Rob Anderson and James Phamsopha are now heads-up for $65,780 and the 2017 Poker Night in America Main Event title. Runner-up today takes home $46,157. The payouts are career-bests for both players. 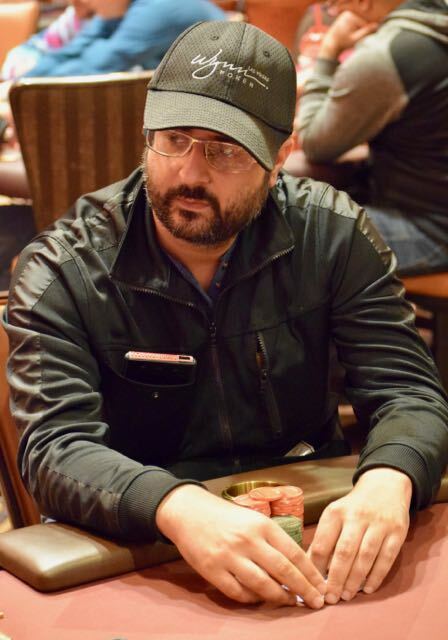 Ubaid Habib had to lay down trip 5's 5 hands ago - it was the right laydown to a better kicker from Rob Anderson - and now he faces a 5x preflop raise from James Phamsopha. With just 12BB total, Habib looks down at KQ and moves in, only to see Phamsopha snap-call with QQ. There's no improvement and Habib is out in 3rd, a $29,690 cash. Heads-up play is about to begin. 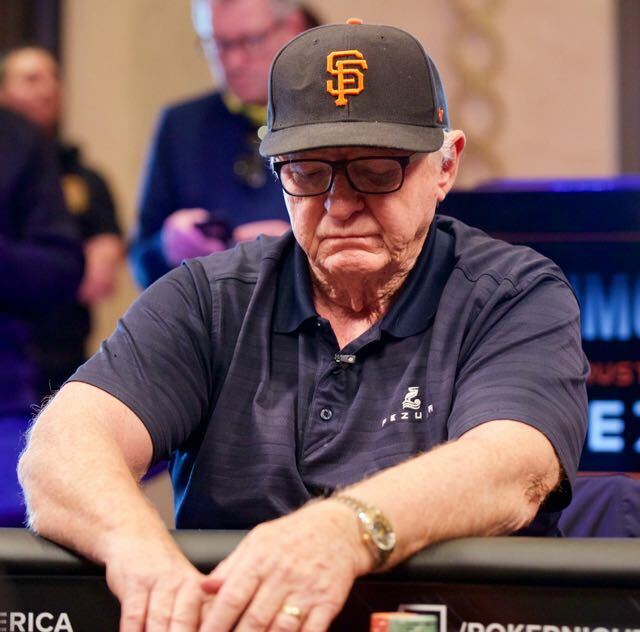 James Phamsopha opens, action folds to Archie Snider who thinks quite a while before moving all-in, and Phamsopha finds a call. Snier is holding 88, with AJ for Phamsopha. Barry Greenstein shows up, "Ace On The River," and Snider is out in 4th place, a career-best $21,977 cash. 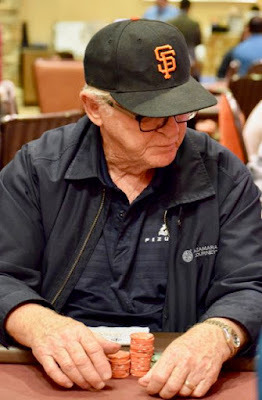 Michael Cooper 3-bets from the SB with A8, but James Phamsopha opened with QQ, moved in and Coop felt he was committed, calling off his stack. Coop his the 6-8-6 flop but was jsut as far behind as before. 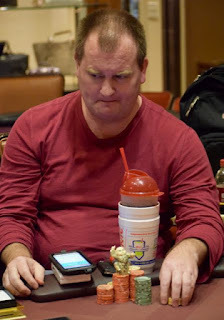 The river 6 gave both players a boat, but ended Coop's day in 5th place. Today's 11am Daily Tournament is the first one under our new Daily Tournament schedule design. 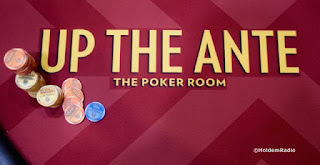 There's now a First Saturday Monster Stack on the schedule - 20,000 starting stacks, $40,000 guaranteed for a $345 buyin. The first Monster Stack is this Saturday at 11am. The standard Saturday daily tourney is now a $20,000 guarantee $235 buyin with 15,000 starting stacks. Check out the entire DAILY TOURNAMENTS schedule here, we look forward to seeing you. Kao Saechao took home first prize in Sunday's $250 Action8. Here are all the payouts. 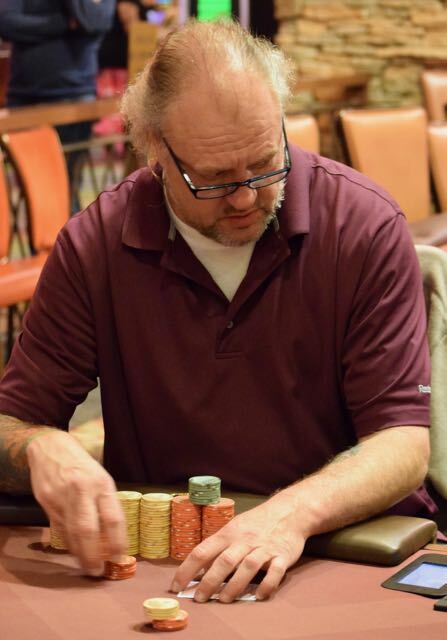 Chrsitine K took top honors in the final event of the PokerNight series. Here's the final results. 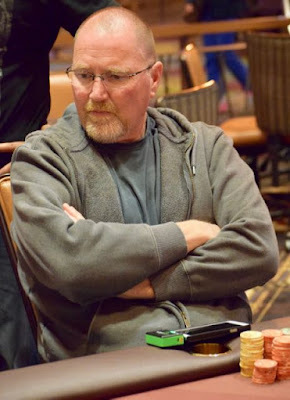 Archie Snider opens, Tipa Alam moves all in and Snider snap-calls, having Alam covered. The flop pairs Alam but he remains well behind. 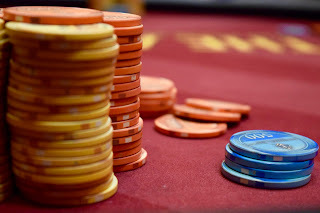 The turn and river go and Alam is out in 6th, with the final 5 advancing to Monday's TV Final Table. Ubaid Habib opens for 125,000, James Phamsopha (above) and Rob Anderson both call. 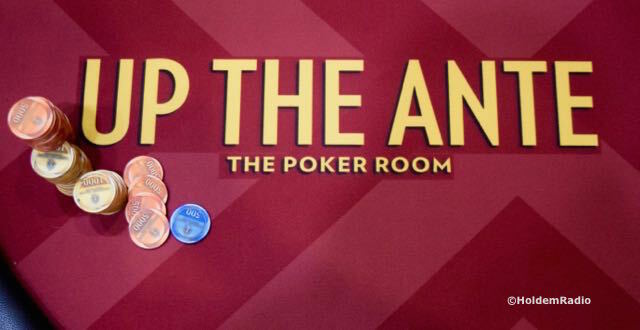 The players all check the flop, then Anderson makes it 225,000 on the turn. Habib moves all-in to put both Phamsopha and Anderson at risk. Phamsopha undershoves, and Anderson seems pained by the fact he lets his cards go. Phamsphoa - for the flopped nut flush, but he needs to dodge the board pairing to hold. The river is and there's a double. Down to his last 260,000, Archie Snider (above) moves all in UTG. Chipleader Ubaid Habib and James Phamsohpa both make the call. BB Michael Cooper does a bit of pot-odds-calculating out loud, then finds a fold. Snider moved in with A4, there was a 4 on the flop, a 4 on the turn, and trips helps Snider triple up to 815,000. 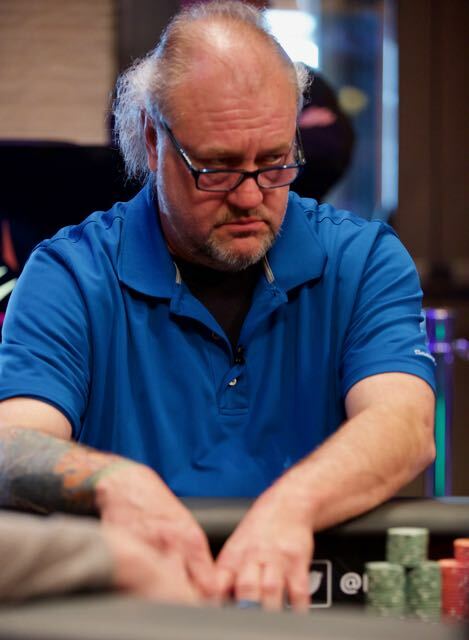 Paul Lentz, Jr. of San Francisco picks up 8th place in The Final Table Main Event, cashing for $8,785. Hand details are unavailable as DanTheUpdatesDude was over with the Action8 getting the 7-way-chop details and winner's photo. Ubaid Habib leads the way with 2 eliminations to go in the Main Event. Habib has 4Milly of the 9Milly in play. 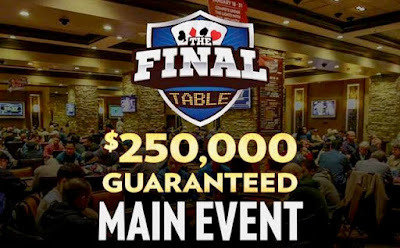 Tune in to twitch.tv/pokernighttv Monday starting at 12:30pm to watch the final 5 players in The Final Table Main Event. The LiveStream is a 30-minute delay with hole cards and commentary. Tune in, join the Twitch Chat, and #NoSpoilersMonday from our blog, we're not posting about the action until AFTER it appears on the LiveStream. Check out the photo for all of tonight's payouts. 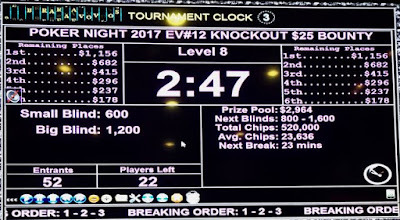 From Kyle Kitagawa in 10th to Phillip Rhodes in 18th, here's the next set of Main Event payouts. Kyle Kitagawa moves in for his last 287,000 (11BB), Ubaid Habib (above) calls, Sean Drake moves in for his last 313,000 and Habib calls both bets. The pairs both Drake and Kitagawa, also gives Drake a backdoor flush draw as each look to come-from-behind to crack Kings and stay alive. Turn is , the flush draw is alive for Drake ..
River ... , a double-elimination for Habib to move to the chiplead. Kitagawa was the shorter stack, so he cashes in 10th for $4,794. Drake picks up 9th, a $6,581 cash. 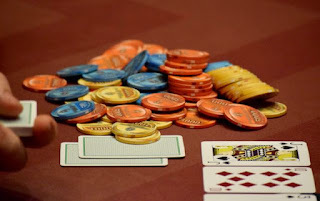 Players are on a 10-minute break for a color-up. When play resumes, action is 3 eliminations from the end of the night.